The Elms B&B is a magnificent Georgian House dating back to the1920's, many of the fine original features have been lovingly maintained including wooden panels and old radiators and King Size four poster bed. Although the majority of furnishings are modern to provide for the comfort of today's visitor. And the first class traditional English breakfast, will set you up for the day whatever you choose to do. Clotted cream teas, Fully Licensed. The overall feeling at The Elms B&B is one of well-being and comfort, with emphasis on ensuring all guests have a relaxing, luxurious and stress-free break. 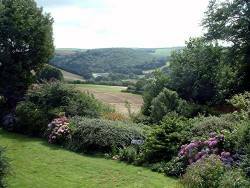 A warm welcome awaits you at Polmena House, set in 2.5 acres of landscaped garden and paddock, situated just a mile from Lostwithiel, with stunning estuary & rural views. Ideal base for the Eden Project (approx 15 minutes by car) Lanhydrock House and Fowey Harbour. Two spacious ensuite bedrooms:- the Balcony Suite, with a super king double or twin beds, lounge area and balcony or the Paddock room, a King double with garden & countryside views. Non-smoking. Ample parking on drive. Children over 6 welcome. 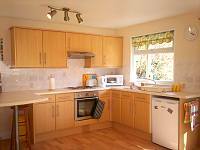 Cornhill Farm Cottages form part of a 130 acre, family run working farm, which produces beef and cereals. Situated on site there is a farm shop, stocking daily essentials. The world famous Eden Project is within walking distance of the cottages and anyone who wishes to walk or cycle, will benefit from a £3.00 discount off the entry price. 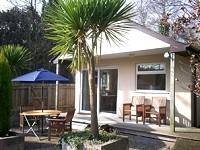 Searching for a self-catering holiday home close to the Eden Project? Look no further than Rose Cottage Chalet where you will wake to the sound of bird-song rising from the Eden Project’s woodland surrounding the chalet. Guests who walk down to Eden enjoy a discount of £4 each off the price of their admission to the Project. A week in the chalet costs from £150. Please enquire for shorter breaks.